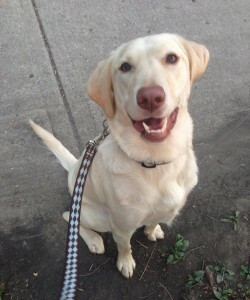 Having the right equipment not only makes the process of leash training in busy neighborhoods like Andersonville, Lincoln Square and Roscoe Village SO much easier; it can also be the key to your dog’s safety as he or she learns the rules of the road. Once you have two weeks of super duper behavior, you can start considering phasing out extra contraptions. Here’s a few items we like. 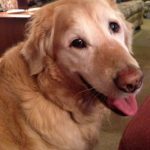 We always prefer to support our favorite local businesses like 4Legs but if you are not in Chicago or need help in a pinch, (not the collar, please) do shop with Amazon Smile so your purchases help your favorite charitable organization. A sturdy 6-foot leash allows your pup some room to sniff but not so much distance that he or she could get injured. Be sure the buckle is hearty! BUT, the smaller the pup, the thinner the leash and less bulky the clasp should be. 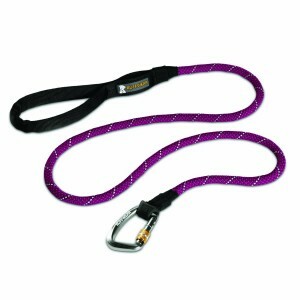 If you find the bulk of this leash is too thick for your hands; Lupine makes a nice leash that gathers easily in one hand and Red Dingo makes an adjustable leash for those tall dogs who need to stay closer while working on leash walking skills. For strong pullers, a thick front-clip harness works best while you are working on leash manners. The SENSE-ation harness is another great option that is a bit easier to get on and fit if you have multiple folks walking your pup; it is a tad less sturdy though. The Freedom No-Pull harness is best for SUPER strong pullers and the velvet straps are much kinder to pooches with sensitive skin. 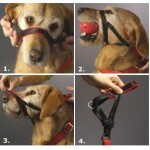 Both need to be properly fitted and ALWAYS make sure the strap in the front goes ABOVE your dog’s shoulders, not below. If you have a low rider like Gavin, sometimes head halters are a better fit while training. We love the safety feature on the New Trix head halter and like that the leash attaches to the back so your dog’s neck and face are not twisted during training. Make sure to spend at least a couple weeks conditioning your pup to like the head halter. Not an appropriate tool for dogs with neck or cervical issues. NEVER, ever give leash corrections; ESPECIALLY with a head halter. For narrow chested dogs, sometimes harnesses can gape on the sides. Attach a carabiner to the ring of your harness and your dog’s collar to prevent ANY chance of him or her slipping out of their gear and getting hurt. Safety is crucial! LOVE this water bottle! Humans drink from the top spout then pop off the handy dog water bowl you so can share without the ick factor. Great for walking through the park and hitting all those fountains on a warm day. And, your neighbors will not yell at you for letting your dog drink straight from the fountain. One of the biggest inspirations for the Bark Pouch was leash walking. It is so much easier to leash train with a pouch. For warm days, no need to defrost it; take your pouch outside frozen and it softens while you walk. A little goes a LONG way, one tiny squeeze is all your pup needs to be reinforced. 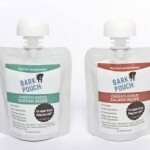 One pouch should last 2-3 walks. Keep refrigerated in between sessions.